Heave Ho is a physics-based local multiplayer adventure across an impossibly wide ravine. Heave Ho unites up to four players with a simple goal – don’t fall to your death. Grapplers will use their own two hands and the outstretched grip of their friends to swing, fling, and soar across each level on their way to victory. Grab one another’s hands, climb across dangling bodies, and swing your pals to safety in a wobbly, dangly mass of limbs. Customize your character with all manner of stylish accessories and zany accouterment in a vain attempt to remember who you are and which of your hands is the only thing between you and the plummet of doom. 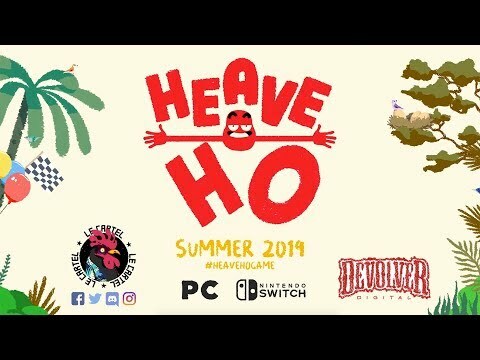 The upcoming Heave Ho PC and Switch release date is Q3 2019 in the US and the UK. Notify me when Heave Ho is available.